Hours: Daily through Labor Day, 10 a.m. - 8 p.m. The splash pad runs in four-minute cycles by hitting the orange posts at each end of the splash pad. Water does not continuously run in an effort to conserve water. Children ages 2-10 can have fun outdoors climbing aboard the Alice Dean steamboat, firing a water cannon, guiding toy boats along a river and running the general store. This farm-themed aquatic playground is a hit with kids big and small. The water area features a splash pad as well as a man-made creek with lots of rocks to climb on. This regional playground in Central Park opened last summer and features an innovative playground and splash pad with a futuristic theme to spur your child’s imagination. There is lots of fun to be had at this spray park! If the water is not flowing, you can activate it by touching one of the two yellow post located at the facility. Hours: Daily through Labor Day, 10 a.m.- 8 p.m. The splash pad at Billericay Park is also in close proximity to the newly added little free library and the English phone booth, representing Fishers’ sister city in Billericay, England. The splash pad runs in four-minute cycles by pressing the activation boards. Enjoy Westfield’s only splash pad, and while you are there be sure to check out the newly redesigned playground. Hours: Mon-Sat, noon-7 p.m. ; Sun, noon-6 p.m. The outdoor aquatic center features a lined and heated Olympic-size 10-lane, 50-meter pool with slide, diving pool with springboards, beginner pool with fountains, sun deck, snack bar and locker rooms. There are also over sized umbrellas that provide plenty of shade for mom and dad. With three outdoor pools, including splash pad and kiddie pool, there is tons of watery fun to be had here. You can even order pizza for pick up from the SUBWAY inside! Kids will love this large interactive splash pad in the midst of all the fun. Test your obstacle course skills on the water at the Aqua Adventure Park! It&apos;s the best of both worlds, a beach and inflatables in one location. 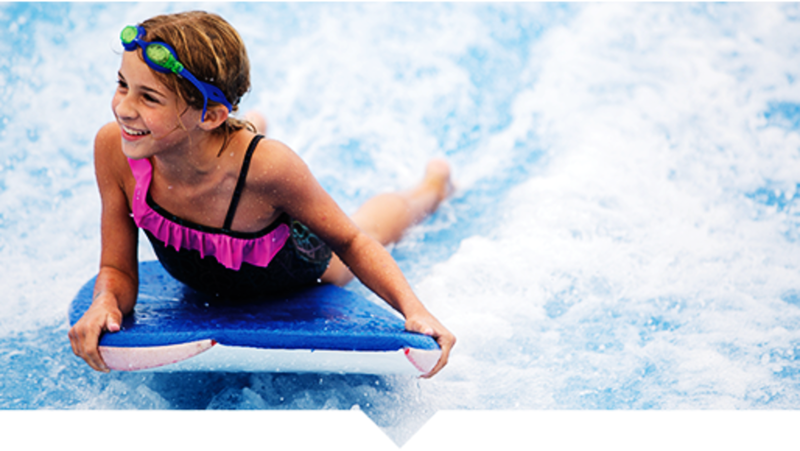 Hours: 11 a.m. -7 p.m.
Surf the waves on the FlowRider®, scale the wall of the AquaClimb®, let the little ones splash in the kiddie pool or just relax in the Lazy River – there is fun for all ages a the The Waterpark! Enjoy a last splash of summer by visiting these splash pads and water parks in Hamilton County, Indiana before summer is over! Did we miss your favorite spot to cool off? Let us know in the comments below. Don&apos;t forget to follow us on Facebook, Twitter and Instagram and tag us in your photos with #VisitHC to share your experience. Happy splashing!